It’s been a long road back from recession. The recovery has been slower than I would have liked, and there are a thousand different views on the Fed’s decision making. But the path was eased by strong monetary policy(! ), and it helped us to get where we are today—on the road back to full employment and price stability. Central bankers have come in for a lot of criticism over their handling of the financial crisis and its aftermath, and in particular have been accused of indifference towards the fate of the poor, while adopting policies that make the rich richer. They rarely respond to those criticisms, or engage with their critics. It’s therefore noteworthy that Benoît Cœuré, a member of the European Central Bank’s six-person executive board, sat down for a joint interview with two activists from a protest group that has staged a series of demonstrations against the institution he works for, and is planning more. The interview was published in Germany’s Sueddeutsche Zeitung over the weekend. The two protesters were particularly critical of the ECB’s involvement in the Troika – the group comprised of the International Monetary Fund, European Commission and ECB that administers bailout programs in troubled euro-zone countries. The Troika has come under intense criticism for demanding too many cuts to public services. “In Spain, 400,000 people have been driven out of their homes; in Greece, almost one-third of the population no longer has access to the healthcare system and 40% of its people are poor. All of this is clearly linked to the Troika’s policy,” said activist Werner Rätz. “This has shielded a great number of European citizens from poverty,” he said. He didn’t apologize for austerity measures required by the Troika. NEW YORK–Federal Reserve Bank of St. Louis President James Bullard said Thursday that an improving economy and rising price pressures mean the U.S. central bank is getting closer to the time when it will need to raise short-term interest rates. “I don’t think financial markets have internalized how close we are to our ultimate goals, and I don’t think the [Federal Open Market Committee] has internalized how close we are to our ultimate goals,” Mr. Bullard said in a discussion after a speech at the Council on Foreign Relations. He said, after a dreadful first quarter, he sees the economy moving back to and sustaining a 3% growth rate, as inflation continues to move higher and breaches the Fed’s 2% target by next year. Meanwhile, he sees what is currently a 6.3% unemployment rate edging down to 5.8% by year’s end. If this is achieved, it would result in an economy that has moved back toward a far more normal state of affairs, even as Fed policy is still at emergency settings, he said. “I’m starting to think the economy could tolerate at least a little bit of the central bank getting back to a more normal stance” when it comes to monetary policy, Mr. Bullard said. I believe that any undergraduate essay containing these arguments would get a resounding F, but Federal Reseve members get off scott-free! Things are getting worse, not better, and the first quarter slump may be indicating ominous things to come. The reality, however, appears to be much bleaker. The government uses a relatively narrow definition of unemployment that includes only people who are actively looking for work. That means unemployment can fall for good reasons (because people are finding jobs) or bad ones (because they’re giving up looking). The recent decline in long-term unemployment is being driven by the bad reasons. 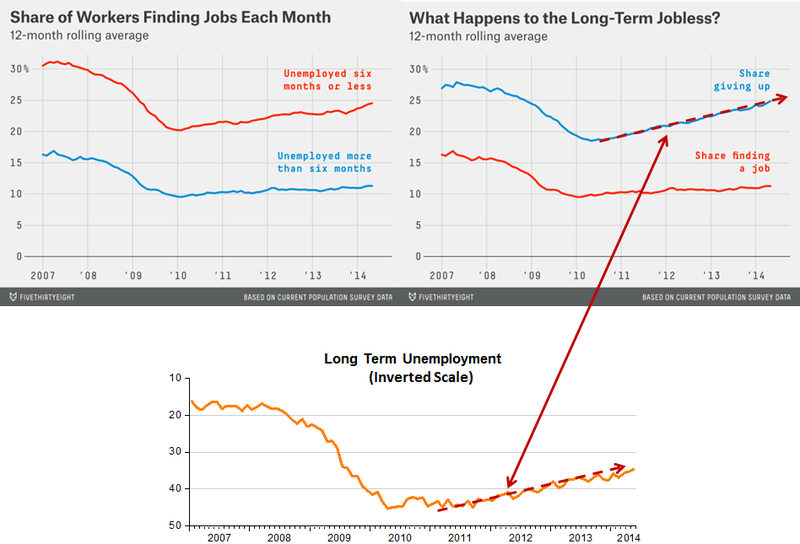 I supplement his charts with an additional one that clearly shows that long-term unemployment (inverted scale) falls by as much as the labor market drop-out increases. Bullard and other FOMC members should know that that´s the bad way to solve the problem, although he can always argue that the “(raw) numbers are on his side”. The somnolent United States Federal Reserve is taking large and uncalculated risks in its current policies, possibly inviting another and even more-sustained recession. Sleeping at the wheel is reckless. 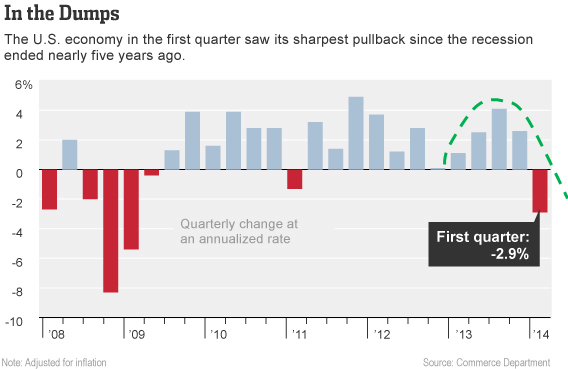 As we saw in the first quarter, the U.S. real economy is hardly a bull, shrinking at a 2.9 percent annual rate. The blame is falling on (regional) bad weather. However, the U.S. had bad weather back in 1985 and 1996, but no 2.9 percent drop in real output. Can the Fed Wake Up? Few have connected the Fed’s scaling back its quantitative easing (QE) program with the Q1 plunge. Maybe a direct line cannot be drawn. But surely there is a connection between the deathly pall of Q1 and a Fed that sleepwalks towards its putative goal of 2 percent inflation, while the idea of robust real growth becomes but a daydream of years and leadership gone by. As noted by many, the Fed after 2008 has been content with just the minimum amount of stimulus to prevent outright deflation—similar in that regard to the Bank of Japan, through most of the island nation’s gloomy and mildly deflationary 1992-2013 years. Minutes of Federal Open Market Committee (FOMC) consistently reveal the 12-member board had little but inflation scares, even as Americans lost jobs and business went under on a scale unmatched since the Great Depression. Reading the public pronouncements of many of the FOMC members confirms suspicions that many regard real economic growth of secondary concern, if that. The Fed, as an institution, refuses to wake up. Yet the gathering risk throughout the last six years has been another recession, and never rising inflation, by any meaningful measure. Indeed, until very recently there has been outright deflation in U.S. unit labor costs, even as inflation-hysterics manically hammered at klaxon with hammers. In fact—as so often and expertly graphed in this space by Marcus Nunes—the last six years have weakest recovery from a recession since WWII. And (again, as recently noted in this space) sharp contractions in real and nominal GDP—as we saw in the first quarter—are often associated with actual or pending recessions. By somnolent dithering, the Fed may soon wake up to a catastrophe, and that is a recession when interest rates are already dead and the Fed already publicly committed to snuffing the QE program entirely. No More Comfy Snoozes at the Fed? Or perhaps (or probably) the Fed bankers will choose another option in a new recession: Assert the Fed has a single mandate, that of zero inflation, and that as an institution it is succeeding brilliantly. That is the dream of central bankers everywhere! The US economy is weak and there isn’t much left in the Fed’s tool kit beyond a shift away from talking about when it will exit from zero interest rates to things it could do–like buying a wider range of assets–to at least sustain modest growth. Update: Bad omens. 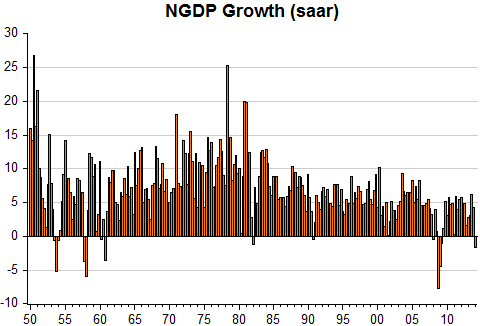 In most of the pot war period, negative NGDP growth, when it ocurred, was always (until now) associated with a recession, although not all recessions experienced negative NGDP growth. The chart illustrates. Halting QE = Active Monetary Asphyxiation? The recent historical and empirical record strongly suggests central bank quantitative easing (QE) works. The Bank of Japan ran a QE program (the buying of assets, usually bonds, by a central bank) from 2002-2006, coincident with their only sustained economic expansion since 1992. And, of course, the Japan economy is growing again, concurrent to the BoJ’s moderately aggressive QE program, part of the Abenomics package. BTW, famed Stanford economist John Taylor authored a paper in 2007 gushing about the success of the 2002-6 BoJ QE program—and such a QE program was heartily advocated by iconic economist Milton Friedman in 1998. Also, the U.S. economy has grown in stutter step to the Federal Reserve’s stop-and-go QE programs as well, even as federal fiscal deficits contracted sharply. The riddle is whether both the Japan and U.S. economies will slip into stagnation again without QE, as long as there is a global glut of capital holding down interest rates, and inflation is dead—or even if inflation is near 2 percent on the PCE deflator, the putative Fed target. The riddle might even be reframed: When central banks do not conduct QE, are they actively engaged in monetary asphyxiation? As posted recently in this space, consulting firm Bain & Co. has forecast chronic global tsunamis of capital for years ahead, pushing interest rates down. 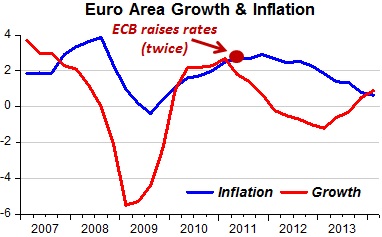 What happens if a central bank targets a 1 percent to 2 percent rate of inflation, when money markets are flooded? Of course, interest rates cannot drop below zero, even when they “should.” A 1 percent to 2 percent inflation target may result in a central bank that effectively asphyxiates the economy, with resultant interest rates in the same or lower ballpark—but rates not yet low enough to stimulate growth, nor dissuade savings. The resulting weak aggregate demand neither sops up the excess capital, nor results in higher interest rates or inflation. Call it “perma-zero-lower-bound (ZLB)-stagnation”. Is that not a picture of Japan through much of recent history, or of the U.S., of late? With global capital markets glutted, and ZLB ever knocking on the door, perhaps central banks should regard QE as a permanent policy, or at least very long-term, thought of in years rather than months—and after all, the BoJ stuck with the 2002-2006 QE program for four years successfully, and the record suggests the BoJ simply should have kept QE going. Interestingly enough, even University of Chicago scholar John Cochrane now says converting the national debt into excess bank reserves will not be inflationary, as long as interest is paid on those reserves. He even says the Fed can pay those reserves by printing up more reserves. Call that a “get-out-of-debt-jail-free” card, a welcome fillip for taxpayers. The Fed and other central banks have stepped into a new world order of chronic capital gluts and consequent low interest rates. The traditional central bank tool for stimulus—lower interest rates—is as useful as a firehose against a flood. Oddly enough, one can wonder if central banks can even raise interest rates—with so much capital afloat, long-term rates may hardly budge. A determined central bank raising short-term rates higher and higher will, ironically, ultimately obtain lower interest rates—recessions and weak growth do not make interest rates go up. And as Milton Friedman famously noted, low interest rates are a sign of tight money. A central bank cannot tighten its way to higher rates in the long-term. In a capital-glutted world, a central bank will only lower rates closer to zero. 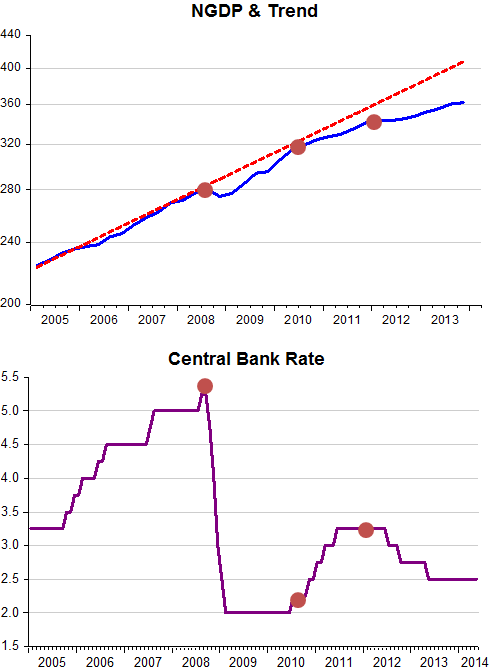 QE may be the only real tool central banks have. (Supply-side tax cuts are a good idea too, but that is whole ‘nother universe). Happily enough, the abundance of capital radically mitigates any bottlenecks or supply-side restrictions that may result in higher prices. Capital is attracted to any market in which prices surge. Indeed, it is folly for central banks to concern themselves with commodities inflation—without such inflation, new supplies of commodities cannot open up. Consider the recent explosion of U.S. oil production in the wake of higher oil prices. Global oil markets are a study in grievous structural impediments, but higher prices have done what they always do (at least in free markets). In commodities markets, higher prices compel supply growth. Rather than genuflect to the encrusted bromides and doctrines of yesteryear, central bankers today must consider what is at hand. Interest rates may be near ZLB for the duration, and the duration may run in decades. Capital is cheap, abundant and hungry, and new businesses and supply will open up if there is demand. The only monetary channel left to boost demand is QE. Weak aggregate demand has been the recurring bane of Western economies for the last 10 years or more, not too-high inflation. Moreover, QE has no track record of leading to much-higher inflation, although it is associated with better economic growth. QE does have a side-benefit of reducing outstanding national debt, if directed toward government gilts. Yet again, it appears a Market Monetarist approach—that is, targeting robust increases in nominal GDP—is the best policy for central banks. And QE is the best, and perhaps only tool to get there. According to the analysis, the current account is rising and will continue to remain high because saving will rise relative to investment due to the rising population share of ‘high and ultra-high savers’; those aged between 35 and 69 and 50-69. The data tell a different story. As the chart shows, before the Asia crisis of 1997-98, Korea´s current account tended to be in deficit. The crisis is a watershed, with surpluses being the norm afterword. 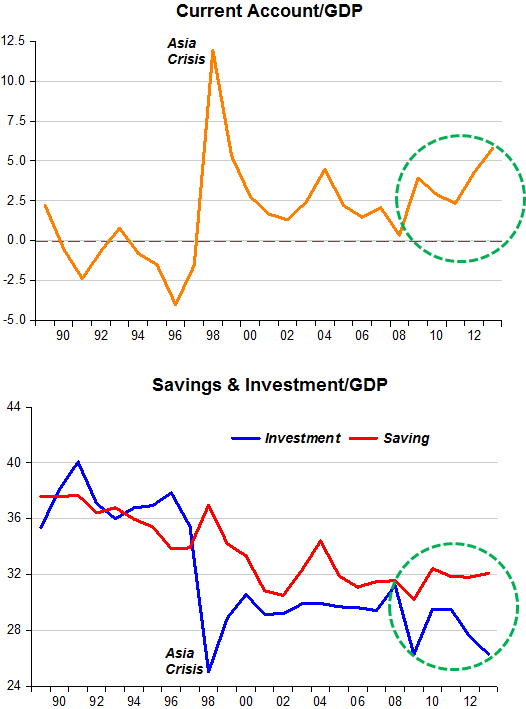 Since the ‘international financial crisis of 2008-09’, Korea´s current account surplus has risen but that appears to be due to a fall in investment and not to a rise in savings. So it appears that the structural arguments put forth are not convincing. What about cyclical arguments? The chart on headline inflation, oil prices and interest rates tell an interesting story. Interest rates had been rising in 2005-06, and when oil prices rose, pushing up headline inflation, rates rose further. Then the crisis hit and oil prices and headline inflation nose-dived. The Bank of Korea was quick to reduce rates and kept them at 2% for 16 months. 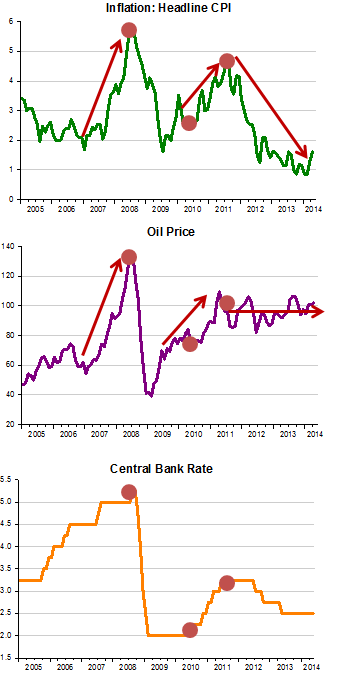 But when oil prices rose again in 2010 headline inflation and interest rates followed suit. For the past 3 years oil prices have remained relatively stable but headline inflation has fallen considerably, a clear indication that monetary policy is ‘too tight’, despite the drop in interest rates. This is another example of interest rates being a poor gauge of the stance of monetary policy. The next chart clearly shows that when the crisis hit the actions by the Bank of Korea were in the right direction. 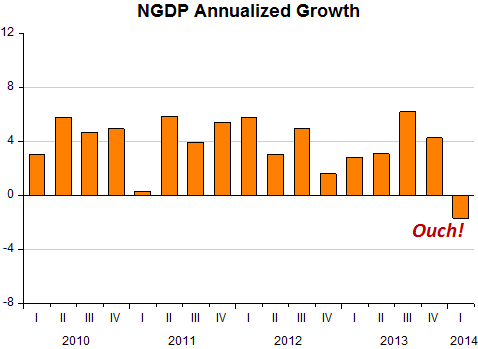 Note that NGDP moved back towards trend. But then the mistake of reacting to the oil price rise ‘spoiled’ everything, with NGDP distancing itself, once again, from the trend level path. And despite the fall in interest rates, the gap is widening, indicating that monetary policy is still ‘too tight’. This is consistent with the observation above that the current account surplus is rising because of a fall in investment. Bain & Co.: Capital Niagara Will Flood Planet. What Is Market Monetarism’s Response? What a world—the “problem” is too much capital. Through recorded history, man has but eked out a living, with little extra labor or capital to improve standards of living. Mere survival was a 24/7 life. But a new report issued by famed consult-a-rama outfit Bain & Co. says the globe is glutted with money, and flood-tides will worsen. “[For] the balance of the decade, markets will generally continue to grapple with an environment of capital superabundance,” writes Bain, in a report entitled A World Awash in Money. (BTW, kudos to the Bainers for speaking English—the report is good read, sans the stilted language or oblique messaging common in the financial industry). Do you like the number $900 trillion? That’s how much capital the globe will have in 2020, up from $600 trillion in 2010, says Bain & Co.
Low yields are the future, and perhaps bubbles, as investors chase yields. The Bainers have a lot of good ideas how to construct Noah’s Arks to survive pending (and probably long-term) capital high tides in their report. One takeaway: It is better to be smart than rich. People with good business or technological ideas will have more leverage with Mr. Moneybags. Investors are a dime a dozen. But how to make money on the money? I just wish I had some good ideas…. But for Market Monetarists, what does a money-soaked world mean, in terms of policy? 1. Central banks need to think about growth, not yesteryear’s war on inflation. That major central banks have engineered weak aggregate demand through monetary asphyxiation has been a Market Monetarism plank. That still stands. More aggregate demand and larger economies would put the huge reservoirs of capital to productive use. Bottlenecks and the supply-side will be widened quickly, thanks to capital abundance. The price signal works. (Side note: Higher rates of inflation would allow a market signal that capital markets are glutted. If inflation is 6 percent, then a 2 percent interest rate sends a signal to savers: “You are a chump.” When inflation is zero, then a zero percent interest rate sends no signal). 2. Interest rates are dead as policy tool. They will be low, flatline. Think Japan, or think Jimmy Hoffa. Market Monetarists are comfortable with that, as quantitative easing has always been accepted by MM’ers, even if QE gives central bankers (and inflation hysterics) the heebie-jeebies. There might be a question about QE, which I pose to readers. After all, when a central bank buys bonds (or other assets), the central bank injects money into capital markets. It is hoped the private sellers of the bonds spend the money they get from the central bank. But if the bond sellers reinvest or save, they only add to capital gluts. Maybe the money ends up in excess bank reserves. Inert. The specter of permanent capital gluts raises an uncomfortable cure to the sickness of weak aggregate demand: federal spending. It may be that federal deficits, financed by QE (to avoid increasing the national debt ad infinitum) is the right response in a non-inflationary world glutted by capital. Of course, the federal budget is defined by venal political considerations, and so this “cure” promises more ills than benefits. Still, there may be a cure. Tax cuts on the wealthy promise little effect as well. They have a higher propensity to just save the money. So the answer is tax cuts on the middle class, financed by QE, but no increase in federal outlays. This might even be a winner, politically. Does Lending Cause Nominal Spending, or Does Nominal Spending Cause Lending? These are assertions about the macroeconomy which Sufi and Mian support with what I would characterize as borderline microeconomic evidence. I have no doubt that there is a strong correlation between mortgage loans and appliance, furniture and home improvement spending, and between auto loans and new auto spending. I also have no doubt that during periods of economic upswing that much of the increase in lending may be subprime. However they provide no evidence in their post that it is in fact subprime lending which is driving home and auto spending, and not home and auto spending that is driving subprime lending. 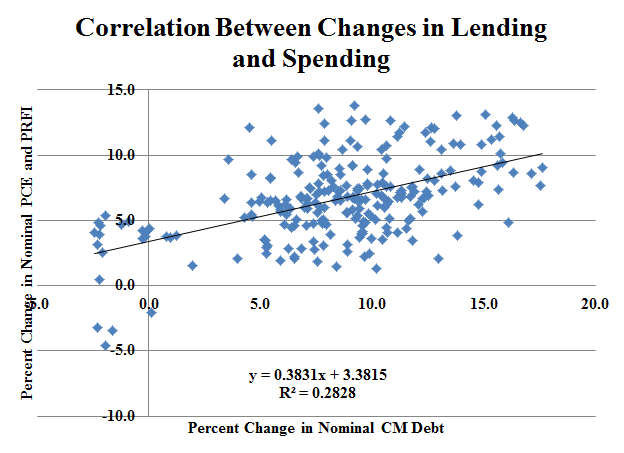 The reason why I bring this up is that one of the most robust results I have discovered, in my investigations into the relationship between lending and spending on the macroeconomic level is that changes in spending precede changes in lending, and not the other way around. In particular, changes in private nonresidential fixed investment precede changes in business sector credit market debt and bank lending, and changes in private residential fixed investment precede changes in bank lending. To illustrate this general result let’s look at the history of U.S. household sector lending and spending. Here is nominal household sector credit market debt and nominal personal consumption expenditures and private residential fixed investment at quarterly frequency since 1951Q4 in log levels. And here’s a scatterplot of the year-on-year percent changes in each along with the elementary ordinary least squares (OLS) results.. The correlation is statistically significant at the 1% significance level. But what we can’t tell simply from looking at this graph or from the OLS results is whether it is lending that is causing spending or if it is spending that is causing lending. One established way of testing causality (Sims 1972) is to construct a bivariate Vector Auto-Regression (VAR) and test for Granger-causality. The following analysis is performed using a technique developed by Toda and Yamamato (1995). The data I used is nominal household sector credit market debt (CMDEBT) and nominal personal consumption expenditures and private residential fixed investment (PCEPRFI) in log levels. Using the Augmented Dickey-Fuller (ADF) and Kwiatkowski-Phillips-Schmidt-Shin (KPSS) tests I find that the order of integration for each series is two. I set up a two equation VAR in the levels of the data including an intercept for each equation. Most information criteria suggested a maximum lag length of seven for each variable. An LM test suggests there is no problem with serial correlation at this lag length. Incidentally, an AR roots graph suggests that the VAR is dynamically stable and Johansen’s Trace Test and Maximum Eigenvalue Tests both indicate the two series are not cointegrated. Then I re-estimated the levels VAR with two extra lags of each variable in each equation. But rather than declare the lag interval for the two endogenous variables to be from 1 to 9, I left the interval at 1 to 7 and declared the extra two lags of each variable to be exogenous variables. Here are the Granger causality test results. I fail to reject the null that nominal household credit market debt does not Granger cause nominal personal consumption expenditures and private residential fixed investment, but I reject the null that nominal personal consumption expenditures and private residential fixed investment does not Granger cause nominal household credit market debt at the 1% significance level. In other words U.S. household sector spending provides statistically significant information about future household sector lending, but not the other way around. As I said, the finding that spending precedes lending at the macroeconomic level is fairly robust across a variety of contexts, so anytime I see anyone jumping to the conclusion that lending causes spending merely based on their correlation, it causes me to cringe. Do the Granger causality results actually mean that spending “causes” lending? No, in particular it could mean that a third variable is causing both lending and spending. But it does cast serious doubt on the idea that lending always causes spending based merely on their correlation. 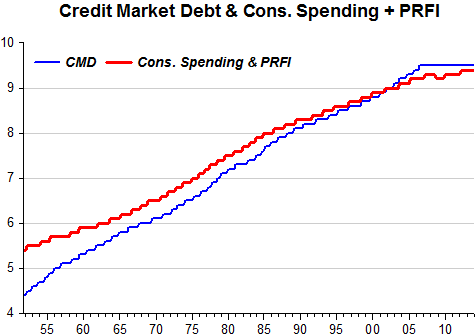 On the other hand, there are strong theoretical reasons why we might expect spending to precede lending. At the macroeconomic level everyone’s spending is someone else’s income. The ability and willingness to take on debt arguably is income constrained. Thus we might expect to see changes in income and spending precede changes in lending. And in fact if it is monetary policy which is the cause of nominal income and spending, as I strongly believe to be the case, then increased lending is not the key to boosting the U.S. economy. Rather increased lending is simply one possible consequence of an adequately expansionary monetary policy.